I had the luck to meet him in person a few weeks ago at Blacklisted Coffee, a new semi-artisan cafe located in West Jakarta that Saxon and Din Tai Fung Indonesia recently spawned. As the Master Roaster of Blacklisted Coffee, Saxon plays a vital role in training the baristas and teaching them to operate the massive coffee bean roaster. Saxon has been involved in the coffee industry for over 15 years and has worked as a consultant, opened many café’s and founded a large contract roasting facility. During this time he has also been actively involved in regional, state and national barista championships and was a Head Judge in the National Barista Championships. He has been a World Barista Championship (WBC) Certified Judge for the past 4 years – judging at the WBC in Atlanta, London, Bogota and Vienna this year. Back in 2004, Saxon founded and operates Pablo & Rusty’s Specialty Coffee – a boutique roaster and group of specialty coffee bars in Sydney’s north. 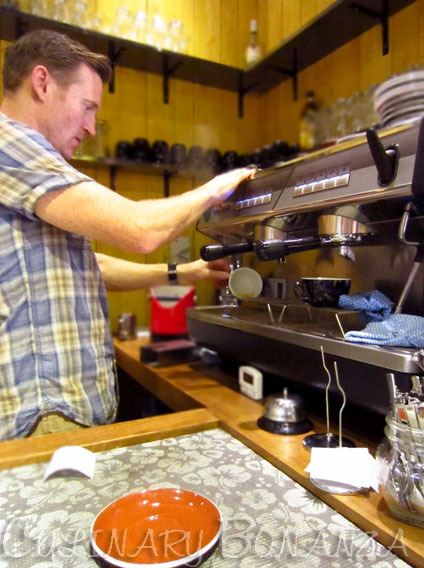 In 2011, the Gordon store was voted 'Sydney's Best Café' by readers of Crema Magazine. 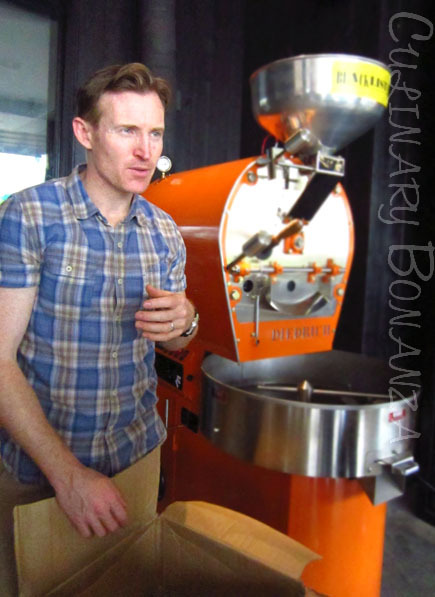 He also recently co-founded Coffee Logic, a training and educational business focused on professional development in the coffee industry, currently holding an SCAA International Educational Partnership Licence. Sounds like a cool dude? Wait until you witness him work wonders at the monstrous caffeine belcher and magically melt away your inhibitions with just a cup of velvety cappuccino. Magical as it didn't taste bitter at all, even to the point of faintly sweet despite not having any sugar added. Before grinding the roasted coffee beans is performed, decide whether you would like to machine-brew it to create a stronger cup of espresso or French-press it to create a weaker black coffee or any other brewing methods. The theory is, the shorter the brewing time, the finer your coffee beans should be ground. 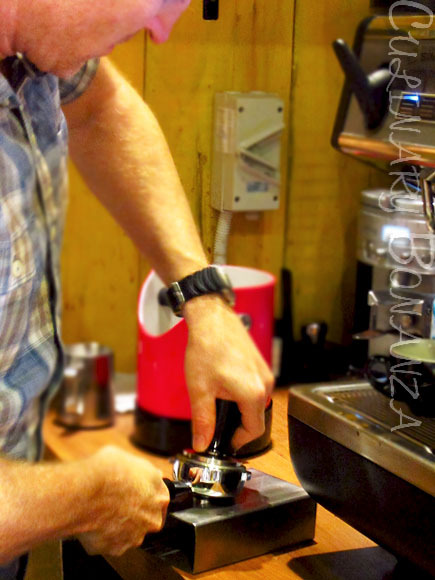 Tamping is the method a barista will use to take a loosely dosed amount of coffee grounds and turn them into a tightly compressed, evenly dispersed puck within the portafilter, where the water and coffee will come in contact when it's brewing. You can read further about why tamping is performed, why it is crucial and what is the proper way to perform it, here. No, this step doesn't require you to punch any numbers or buttons on the coffee machine. In fact 'dialing in' refers to the process where the barista adjusts the possible variables which will affect the way an espresso extracts. 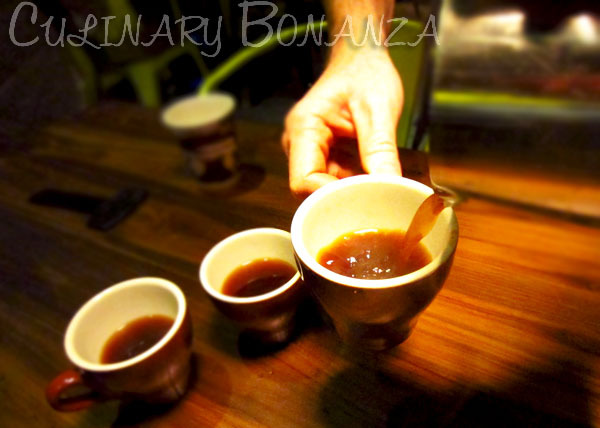 Some of these variables are coffee grind size, water temperature, extraction time, etc. If you are the first customer of the day, it is common if your espresso takes longer to arrive at your table, as the barista (most likely) would be 'dialing in' to create that perfect and up-to-standard cup of coffee for you. Saxon would next 'pull a shot'. This term had its classic origin when early coffee machines back then still had some certain lever, which the barista would pull down and then release to extract the espresso that streams down the tube. Although this lever is unlikely found on modern coffee machines today, as they are replaced by a simpler automated button, the term is still used. Saxon confessed that during his judging duties, he had once tasted a cup of coffee created by one of the contestants in the Barista Championship, which tasted like strawberries & cream! I would remain skeptical until I taste it for myself, however, I do envy Saxon, who, with his profession is blessed with the perks of sampling probably the world's best coffee. (talk about being a judge!). Apparently not all varieties of coffee beans is suited to make black coffee, and likewise, not all would taste good for an espresso. Saxon then brewed us some coarse grind Kenyan coffee, using an AeroPress, a device invented by the company that invented Frisbees! This device is very convenient for travelling because it is portable, light weight and durable. 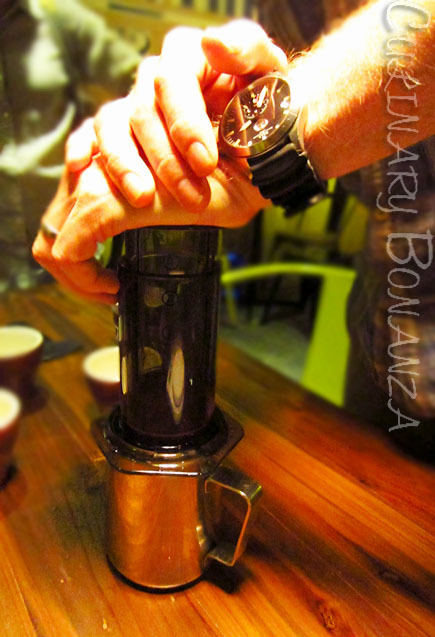 Method wise, an AeroPress is similar to a French Press in that they use a 'plunger' to push the brewed coffee through the filter paper. Kenyan coffee has acidic tartness property, not exactly my preferred kind of coffee, but it is light enough to be drank as the first coffee to start your day. Saxon Wright will be back in Jakarta sometime soon, to have a private cupping session with him, simply call the number below for more information about the dates and fees. Thank you Din Tai Fung Indonesia, Blacklisted Coffee and Saxon Wright for the enlightening Sunday morning!